Gnudi or malfatti, as they are also known, are a kind of gnocchi, which is why they are also just called gnocchi by some people. 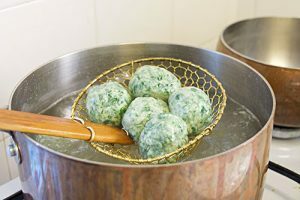 Gnudi and malfatti are little balls or rolls of spinach and cheese, cooked in boiling water, just like pasta. 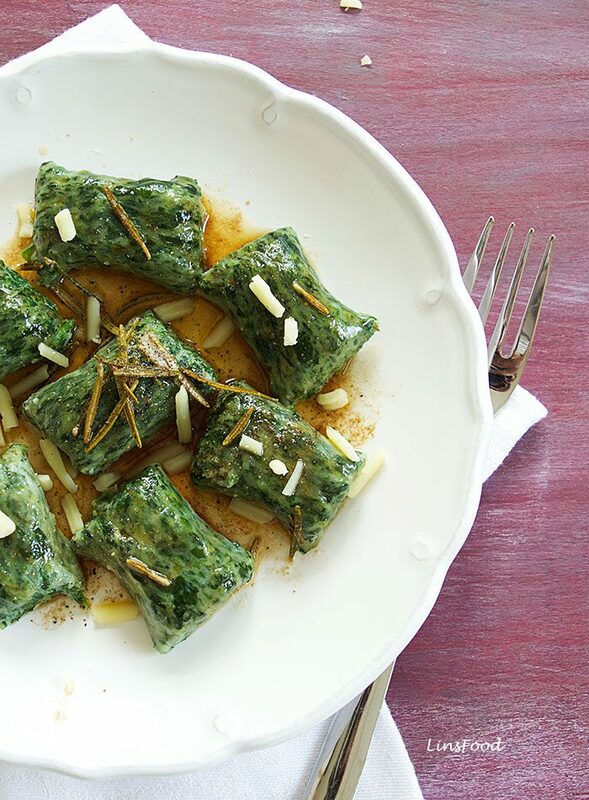 Think spinach and ricotta ravioli but only the filling, with no pasta dough covering it. 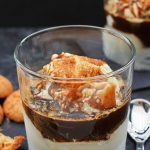 They are one of my favourite Italian recipes for entertaining, because, besides the fact that I could eat them everyday, after all these years of making them, I have yet to come across someone who’s familiar with them! A long, long time ago, someone, somewhere in Italy, must have run out of flour, and decided to go ahead and just cook the filling! Gnudi means naked, from the word, gnuda, and that’s what they are called in Tuscany. So basically, gnudi are naked ravioli. 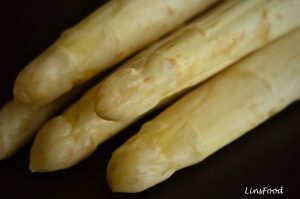 Sometimes, they are also known as Ignudi, the same meaning, which is why I cannot help but think of Michael Angelo’s The Ignudi in the Sistine Chapel, every time I’m cooking them! Malfatti, on the other other hand, is what they call them up in Lombardy, and they are little rolls, like thick fingers. Malfatti means poorly made, referring to their rather rustic look – roll, cut, dust in flour, and there you have it – malfatti! I’ve heard it said that these rustic, poorly made, naked ravioli have a long history, going back to Roman times, and perhaps even earlier. I’ve not really been able to glean any more information on this, despite years of intermittent reading. However, I am pretty confident that they were not created in Napa Valley (US) by Theresa Tamburelli, when she ran out of dough, as claimed by local historian Lauren Coodley, in her Napa: The Transformation of an American Town. Malfatti is apparently famous in the Napa Valley, thanks to the Cittoni family, who runs the kitchen in Val’s Liquor, and whose patriarch, Clemente Cittoni, learnt to make it at the hands of Theresa. 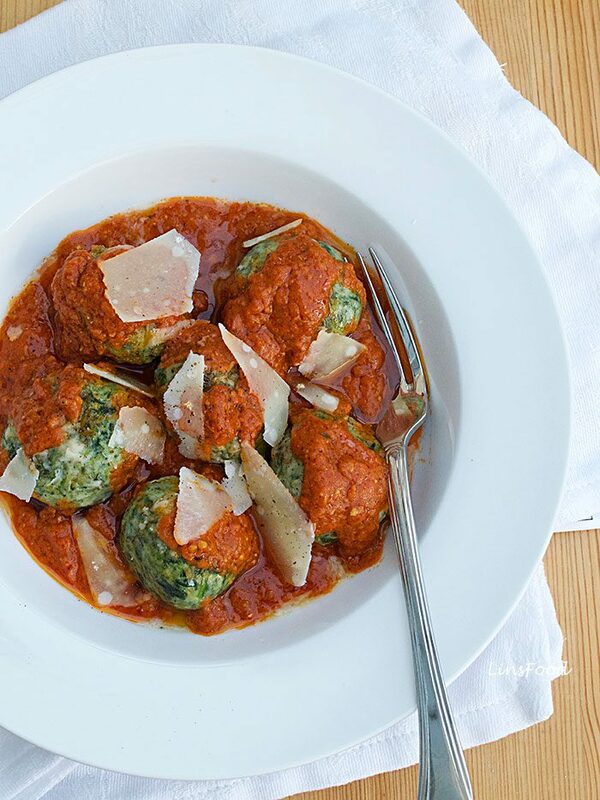 You can read more about the malfatti phenomenon in the Napa Valley in this article. Gnudi are also sometimes made with just the cheese and a starch, whether flour or semolina, and this is the version (with semolina) that in recent years has gained a huge following in the US, after gnudi were added to The Spotted Pig’s menu by April Bloomfield. Suddenly, every American food blogger and food site started making them! And of course, Jamie Oliver is never far behind, even if, as usual, he messes up the recipe! 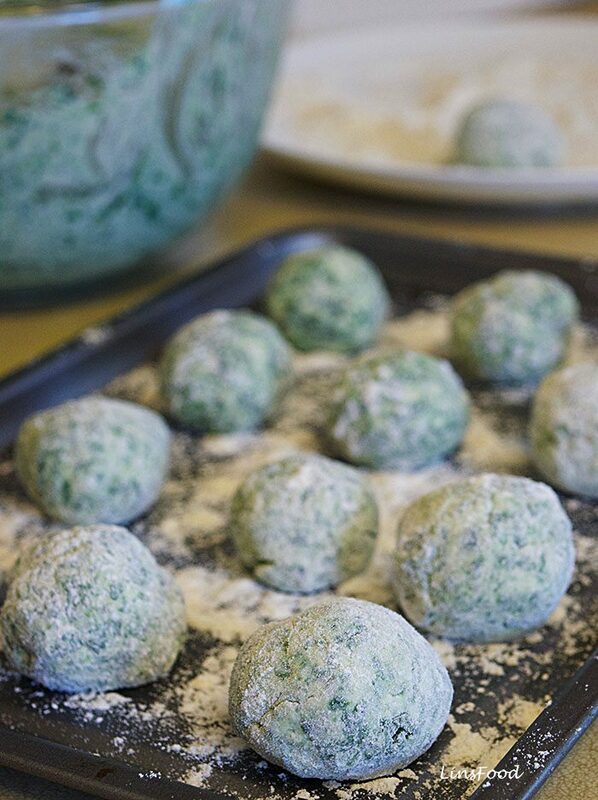 The gnudi recipe I am featuring today, is the traditional spinach and ricotta one, learnt at the hands of Mamma Anna, a former flatmate’s mum, as mentioned in my Carbonara post. I have also been fortunate enough to have had both gnudi and malfatti in little off the beaten track eateries in the Tuscan and Lombard regions. And they all varied in composition and sauce that they were served in. Gnudi and malfatti are often served in the traditional sage and butter sauce, although I serve them just as often with other sauces; a simple tomato sauce is always quick and easy but my favourite besides sage and butter is chilli pesto. 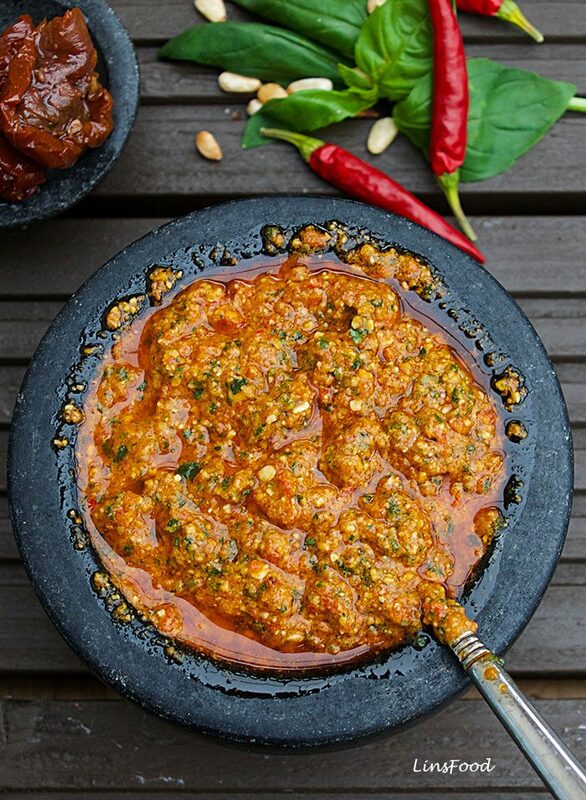 The deep, full on flavour of the chilli pesto is the perfect foil to the rustic, guileless nature of the gnudi. 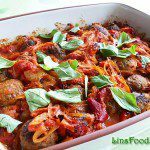 What do gnudi and malfatti taste like? Well, they are very, very moreish. There is no way you can stop at one. Or 6! Have you ever had a spoonful of ricotta or mascarpone? How was that? Heaven, right? Multiply that and add touches of nutmeg, salt, pepper and spinach. And that’s before you take into account whatever sauce you’re serving it with. 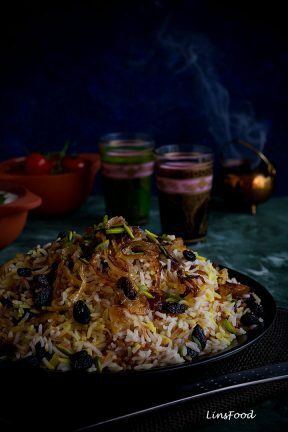 It’s like biting into a cloud of nirvana. 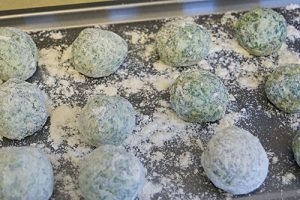 So let’s take a look at a few things to note in making gnudi or malfatti. 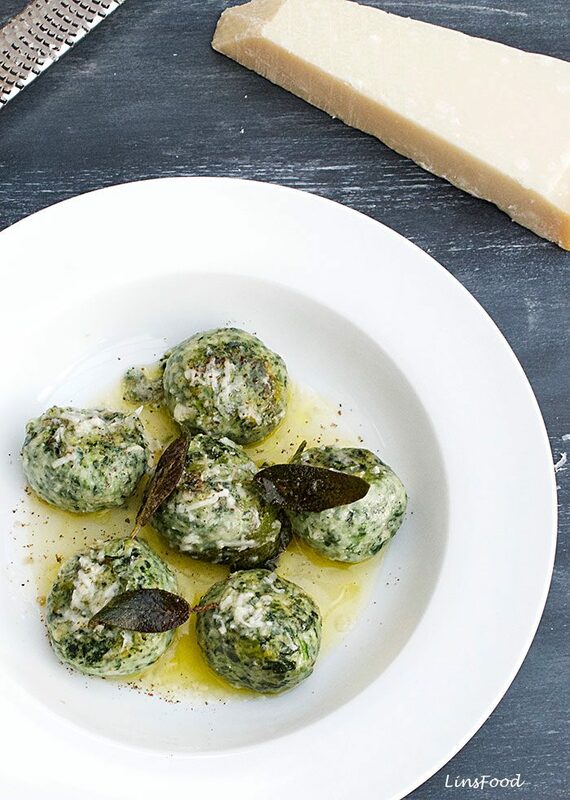 As mentioned above, gnudi are little balls, while malfatti are little rolls, like fat fingers. The images here are of gnudi. To make malfatti, just follow the recipe, and roll into a long log about 2.5-5cm (1-2″) thick, before cutting into fingers about 7.5cm/3″ long. Cook and serve in the same way. Some people use flour, as I do, some use semolina, while others use breadcrumbs. 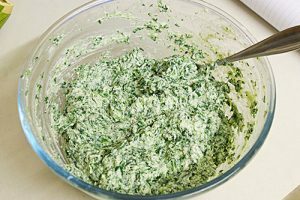 We only use a small amount, just to bring it together, as the overriding flavour is that of creamy ricotta and spinach. This is probably where the biggest difference lies between recipes. Some prefer a higher spinach ratio, while others, like me, prefer an almost equal amounts of the the two. 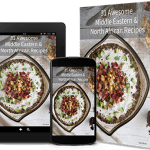 My advice is to follow the recipe here, and then play with it! 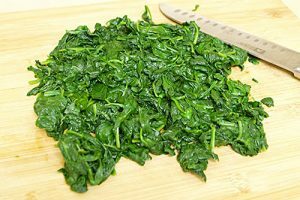 I’ve only ever used fresh spinach, you can use frozen too, but be very vigilant about squeezing it dry, as it does contain more water. Naturally, they are best when eaten warm. You can shape them up to about 6 hours ahead, cover lightly with a damp cloth or foil and keep in the fridge, until it’s time to cook them. I have also cooked them hours ahead, dropped them in boiling water for 30 seconds, then proceeded with serving them with whatever sauce. Gnudi and malfatti can be frozen. Once the gnudi and malfatti are formed in balls or logs, they can be frozen. Open freeze them on a tray for 2 hours. 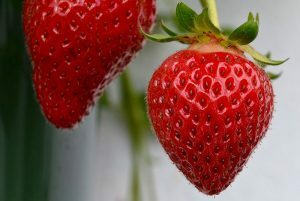 Then place them into a freezer bag or a container and freeze for up to 1 month. 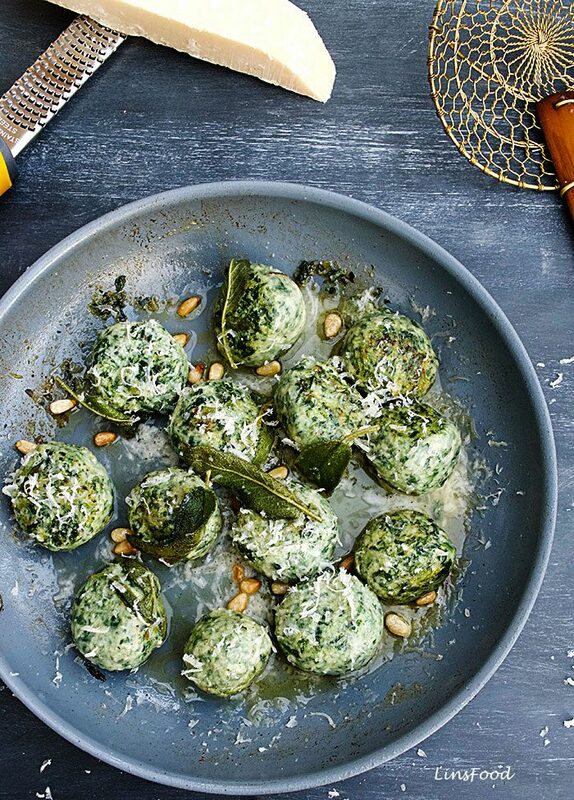 As mentioned above, you can make gnudi without the spinach. Just use equal amounts of ricotta and semolina flour (fine semolina) and follow the rest of the recipe. 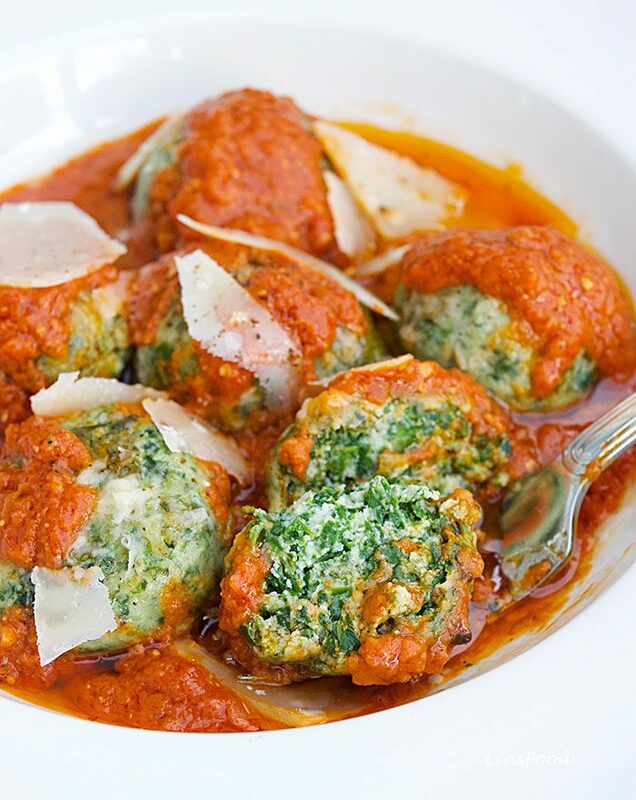 Leave the egg out for eggless gnudi or eggless malfatti. Baked gnudi. After cooking them in water, place them in a baking dish, grate your favourite cheese all over, some breadcrumbs and bake in the oven at 200˚C (400˚F) for 20-30 minutes until golden brown. Or with béchamel sauce or any other sauce you fancy. Have a superb weekend, all! Gnudi recipe. 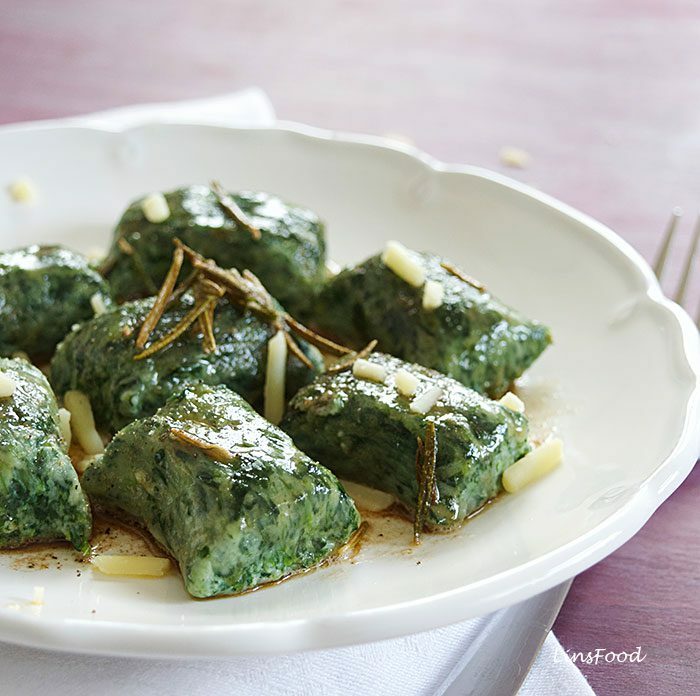 Gnudi or malfatti, as they are also known, are a kind of gnocchi; balls and rolls of spinach and ricotta without any pasta covering them. So, naked ravioli. Place the ricotta in a colander and leave to drain. Rinse your spinach and place in a large saucepan, cover with a lid and leave to cook on medium heat for about 5 minutes, until the spinach is cooked right through. 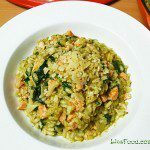 Alternatively, place in a large microwaveable bowl and cook for 2-3 minutes until the spinach is fully cooked. When the spinach is cool enough to handle, squeeze any excess water out, either just using your hands or place in a colander and press down. Tip the spinach onto a chopping board. 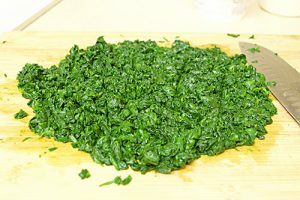 Using a large, sharp knife, chop the spinach up fairly finely, see the images. 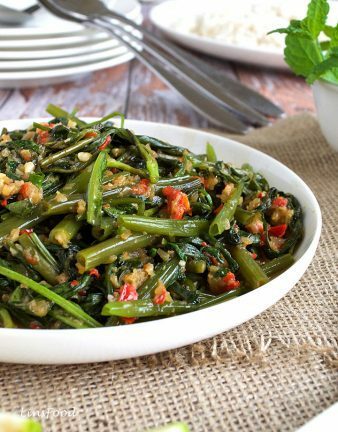 Tip all the chopped spinach into a large bowl. Add the ricotta in, along with the salt, pepper and nutmeg. Using a large fork or ladle, mix it all in, breaking up the ricotta well and making sure everything is mixed in. Add the egg, parmesan and flour in, and once again, mix everything thoroughly. I use my hands at this stage. Tip half the flour onto a large plate. Take a baking sheet and generously flour it, leaving some flour in the bowl for your hands. With well floured hands, form balls out of the gnudi dough. 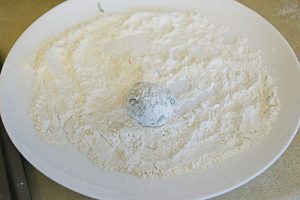 Roll each ball in the flour on the plate, shake off excess and place on the floured baking tin, until it's time to cook. Keep going with the rest of the dough. If making malfatti, take a quarter of the dough and roll it into a long, thin log about 2.5cm/1" thick, on a well floured surface. Cut into 7.5cm/3" long rolls and place on the floured baking sheet until it's time to cook them. Pictures soon! When ready to cook, bring a large pan of water to boil on high heat. Add 1 heaped teaspoon salt to it. When the water is boiling, reduce the heat to medium-high, then slowly drop about 12 gnudi in at a time, depending on the size of your pan. 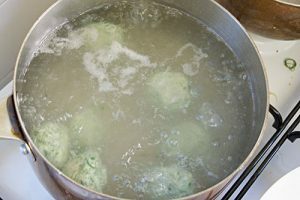 Cook the gnudi for 2-3 minutes; they are done when they float to the surface. Fish them out with a slotted spoon/skimmer and place them aside and keep warm, while you finish the rest off. Let's now make the sauce to serve them with. 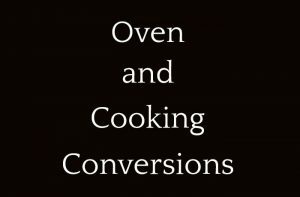 Heat a large frying pan on medium heat and melt the butter. Add the fresh sage leaves to the butter and stir for 1 minute. Add a couple of ladles of gnudi cooking water to lighten and stop the butter from browning (unless you prefer a browned butter sauce). 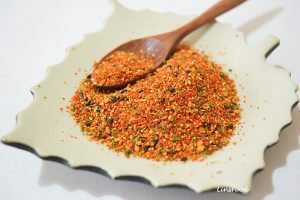 Add a pinch of salt and some freshly ground black pepper. Add 2 tsp of freshly grated parmesan cheese, stir, lower heat and simmer for a minute. Check seasoning and add more salt if necessary. The sauce is done. Gently add the cooked gnudi in, and, give the pan a gentle couple of shakes to roll the gnudi in the butter, and cook for a minute to heat right through and absorb the sauce. Lighten the sauce with more pasta water if necessary. Serve the gnudi with more parmesan and some freshly ground black pepper. Nutrition is based on 8 servings. Prep and total time also does depend on the amount you are making. 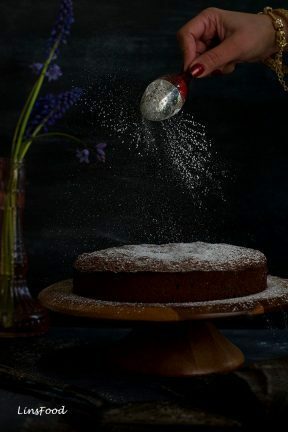 Halve the recipe, if you like. Looking at the picture, I was thinking – this would involve some difficult techniques to master. As always, your instructions are so clear that now I can imagine myself making the delicious dish successfully quite soon. I don’t think I’ve ever seen naked ravioli at Italian restaurants in NY. 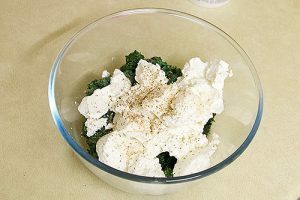 Mascarpone/ricotta & spinach does sound like culinary Nirvana! These Gnudi are simply so delicious and easy to prepare. 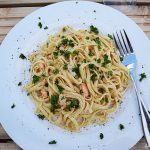 I tried them and cheated a bit: for the sauce I took red pesto from the supermarket. 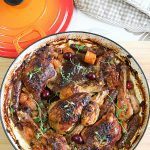 Thank you for sharing this fantastic recipe Azlin! Thank you so much, Sabine! And thanks for trying it. These are simply phenomenal! I have never heard of these before. Definitely trying them this weekend. Thanks for all those tips, they’ll come in handy. 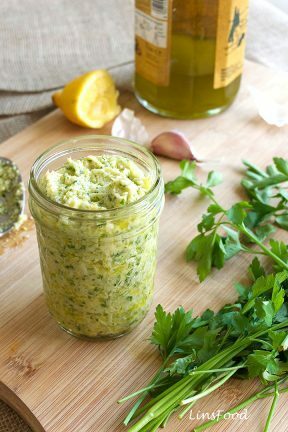 I like the idea of the chili pesto too. Awesome, thanks Mike. Let me know if you make them. Amazing, I have never heard of these, and my grandfather is Italian! Thank you, Azlin, I am going to surprise my grandparents with these when I go visit in 2 weeks. 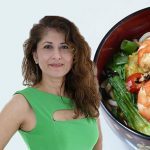 Can I make them at home, then reheat at their place, as you suggested? That should work? Yes, absolutely, Gabriella. If you’re making them hours ahead, cover in an airtight container or use a clingfilm to cover the container. Let me know what they think. Oh wow, the gnudi were a huge hit at the party, thank god I made so many! At first I thought maybe too many, they can freeze them, but they all got eaten up, and everybody wanted the recipe! I’ve given them all your website address. My grandparents really, really loved them. My nonno had tears in his eyes, he said his mother used to make them. So thank you very, very much for introducing me to them! I’m a fan for life! I liked this a lot. You have made it easier, I am gonna try this for sure. Thanks for sharing dear. Cara, if you weren’t married, I’d propose to you right now! You take my breath away with all these Italian recipes. I was just explaining to some friends here in London about gnudi, we haven’t seen them on a menu. 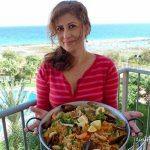 Now, I can show them your pictures and recipe! Grazie! My mamma sends her kisses! Wow! 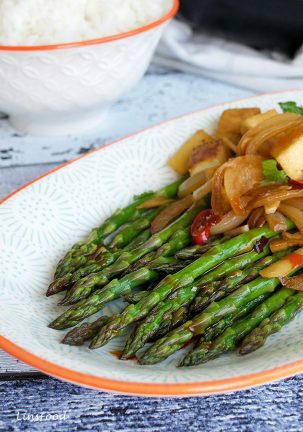 I love that you’re always introducing us to new recipes! Thank you, Dear! A pleasure, thank you, Izzabelle. This is such an amazing post, Azlin! Your posts are such delights to read, there is so much depth to them, you go to such lengths with your information and background knowledge. Pinned and waiting to make! Thank you, Kelli. I appreciate you taking the time to let me know. Do come back and tell me what you think of them.